The stunning dive site of Maaya Thila, Maldives, is home to a myriad of marine life, including eagle rays, sting rays, long nose hawkfish, octopuses, scorpion fish, eels and, of course, sharks. Grey reef sharks and small white tips are the most common, but whale and hammerhead sharks can also be spotted drifting over colourful anemones and bush corals in this beautiful spot. The site is approximately 80 metres in diameter, with depths ranging from six to more than 30 metres and options for both beginner and expert divers, the latter of which can explore the many overhangs, swim-throughs and caves around the site. To catch sight of a large resident turtle, head to the south side where a large swim-through hosts stunning soft corals and blue stripe snappers. Alternatively, head north to an amazing cave dive site, which is home to millions of fish including batfish, parrotfish, anglerfish, dog-toothed tuna, barracuda and lionfish. For divers heading to the ultimate superyacht playground of the Maldives, this is a must-visit spot. The stunning dive site of Maaya Thila, Maldives, is home to a myriad of marine life, including eagle rays, sting rays, long nose hawkfish, octopuses, scorpion fish, eels and, of course, sharks. Grey reef sharks and small white tips are the most common, but whale and hammerhead sharks can also be spotted drifting over colourful anemones and bush corals in this beautiful spot. The site is approximately 80 metres in diameter, with depths ranging from six to more than 30 metres and options for both beginner and expert divers, the latter of which can explore the many overhangs, swim-throughs and caves around the site. To catch sight of a large resident turtle, head to the south side where a large swim-through hosts stunning soft corals and blue stripe snappers. Alternatively, head north to an amazing cave dive site, which is home to millions of fish including batfish, parrotfish, anglerfish, dog-toothed tuna, barracuda and lionfish. For divers heading to the ultimate superyacht playground of the Maldives, this is a must-visit spot. Located off the east coast of Australia, the 125 metre long Fish Rock Cave is home to some of the most sought after marine life in the world. It is renowned for its high number of grey nurse sharks who reside here all year round, so swimming with these graceful creatures is almost a guarantee. 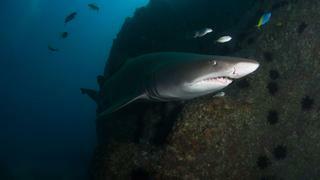 In the summer months, grey nurse sharks rest in the shallow end of the cave, making for fantastic diving. Divers can also hope to spot wobbegong sharks, black rays, giant cuttlefish and black cod within the cave, while moray eels, blue groper and turtles can be seen on the fringes. Depths range from 12 to 24 metres and due to its varied marine life, Fish Rock is one of the world's most amazing cave dive sites. Anyone exploring Sydney on a superyacht and heading north to Brisbane can easily make a stop at the iconic dive site in New South Wales. Located off the east coast of Australia, the 125 metre long Fish Rock Cave is home to some of the most sought after marine life in the world. It is renowned for its high number of grey nurse sharks who reside here all year round, so swimming with these graceful creatures is almost a guarantee. In the summer months, grey nurse sharks rest in the shallow end of the cave, making for fantastic diving. Divers can also hope to spot wobbegong sharks, black rays, giant cuttlefish and black cod within the cave, while moray eels, blue groper and turtles can be seen on the fringes. Depths range from 12 to 24 metres and due to its varied marine life, Fish Rock is one of the world's most amazing cave dive sites. Anyone exploring Sydney on a superyacht and heading north to Brisbane can easily make a stop at the iconic dive site in New South Wales. On the edge of the Beqa Lagoon is a section of protected reef known as the Shark Reef Marine Reserve, now home to a bull shark tagging programme that monitors their behaviour and ecology. 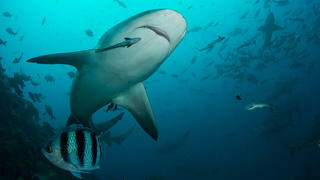 The bull sharks share their home with seven other species of shark, including tiger sharks, silvertips and gray reefs, as well as giant groupers and eagle rays. Drop anchor off Beqa Island and tender to Pacific Harbour to arrange a guided or unguided dive to the Beqa Lagoon with Beqa Adventure Divers. The Shark Dive covers a number of different sites and divers can watch a variety of shark species who are accustomed to visitors, making this trip a must for shark fanatics who are looking to discover breathtaking Fiji on a superyacht. On the edge of the Beqa Lagoon is a section of protected reef known as the Shark Reef Marine Reserve, now home to a bull shark tagging programme that monitors their behaviour and ecology. The bull sharks share their home with seven other species of shark, including tiger sharks, silvertips and gray reefs, as well as giant groupers and eagle rays. Drop anchor off Beqa Island and tender to Pacific Harbour to arrange a guided or unguided dive to the Beqa Lagoon with Beqa Adventure Divers. The Shark Dive covers a number of different sites and divers can watch a variety of shark species who are accustomed to visitors, making this trip a must for shark fanatics who are looking to discover breathtaking Fiji on a superyacht. The Bahamas are arguably the shark diving capital of the world. 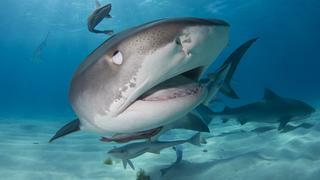 Tiger Beach on Grand Bahama has become a shark swimming hotspot as it is a prime location to see tiger sharks. The sharks live in the shallow waters over an immense sandbank and come in close proximity to divers. It is not strictly a natural encounter as the dive instructors use bait to attract them. However, it does offer a great chance to get up close and personal to the 16-foot predators. A diving experience in Tiger Beach can easily be incorporated into a private cruise or a luxury yacht charter in the North Bahamas. If you want the opportunity to be involved in helping to protect sharks in the area Miami Fleet is offering a scientific learning expedition on board superyacht Usher. 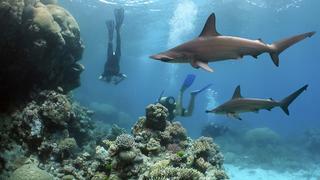 The Bahamas are arguably the shark diving capital of the world. Tiger Beach on Grand Bahama has become a shark swimming hotspot as it is a prime location to see tiger sharks. The sharks live in the shallow waters over an immense sandbank and come in close proximity to divers. It is not strictly a natural encounter as the dive instructors use bait to attract them. However, it does offer a great chance to get up close and personal to the 16-foot predators. A diving experience in Tiger Beach can easily be incorporated into a private cruise or a luxury yacht charter in the North Bahamas. If you want the opportunity to be involved in helping to protect sharks in the area Miami Fleet is offering a scientific learning expedition on board superyacht Usher. 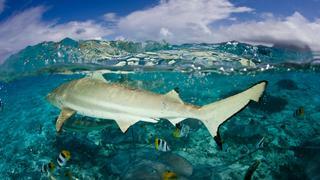 The French Polynesian waters play host to a variety of different species of sharks. The most common are blacktip reef sharks which can be easily identified by the black tips on each fin. Although curious all the sharks inside the lagoons are predominately non-aggressive unless provoked. If you anchor your superyacht in Moorea it is possible to swim with stingrays and sharks in their natural environment without even using a guide. The abundent sea life is just one of many reasons to consider discovering French Polynesia on a superyacht. 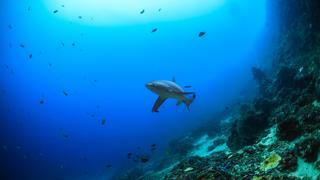 The French Polynesian waters play host to a variety of different species of sharks. The most common are blacktip reef sharks which can be easily identified by the black tips on each fin. Although curious all the sharks inside the lagoons are predominately non-aggressive unless provoked. If you anchor your superyacht in Moorea it is possible to swim with stingrays and sharks in their natural environment without even using a guide. The abundent sea life is just one of many reasons to consider discovering French Polynesia on a superyacht. If you want to experience swimming with whale sharks then South Mahé in the Seychelles is one of the best places in the world to have the opportunity. The island is on the migratory path of these majestic beasts. The season usually starts in September and runs until November, with peak sightings during October each year. 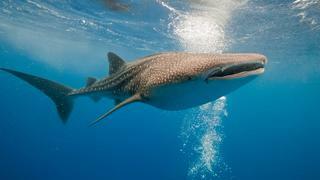 A diving expedition to try and swim with the illusive whale shark can be incorporated as part of seven days exploring the Seychelles on a superyacht. If you want to experience swimming with whale sharks then South Mahé in the Seychelles is one of the best places in the world to have the opportunity. The island is on the migratory path of these majestic beasts. The season usually starts in September and runs until November, with peak sightings during October each year. 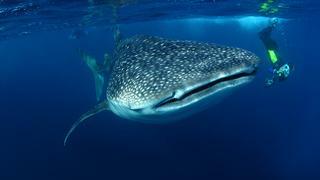 A diving expedition to try and swim with the illusive whale shark can be incorporated as part of seven days exploring the Seychelles on a superyacht. The Galapagos Islands are synonymous with environmental protection and a plethora of wildlife and this is also the case for its shark population. Regularly voted as the best diving location in the world the Galapagos offer the opportunity to get up close with scalloped hammerhead sharks, Galapagos sharks, and sometimes even whale sharks. As the name would suggest, one of the best places to view sharks is Shark Point, off Wolf Island. There are no land visits to this island and the dive site is only for experienced divers. The Galapagos Islands are synonymous with environmental protection and a plethora of wildlife and this is also the case for its shark population. Regularly voted as the best diving location in the world the Galapagos offer the opportunity to get up close with scalloped hammerhead sharks, Galapagos sharks, and sometimes even whale sharks. As the name would suggest, one of the best places to view sharks is Shark Point, off Wolf Island. There are no land visits to this island and the dive site is only for experienced divers. As well as boasting some of the best shipwreck dives in the world Rhode Island also offers blue and mako shark expeditions. Named after their radiant colour, blue sharks migrate thousands of miles each year but in certain areas come close to the shoreline. Encounters with the sharks usually don’t involve scuba diving kit but a full wetsuit is required along with a hood, gloves, mask, fins and snorkel. Shark season in Rhode Island runs from June through to August. As well as boasting some of the best shipwreck dives in the world Rhode Island also offers blue and mako shark expeditions. Named after their radiant colour, blue sharks migrate thousands of miles each year but in certain areas come close to the shoreline. Encounters with the sharks usually don’t involve scuba diving kit but a full wetsuit is required along with a hood, gloves, mask, fins and snorkel. Shark season in Rhode Island runs from June through to August. In the waters off the Cocos Islands, which are more than 300 miles from Costa Rica's coastline, you can see scalloped hammerhead sharks in vast numbers. This experience used to only be open to experienced divers but it is now possible to enjoy the spectacle inside a three man submersible. 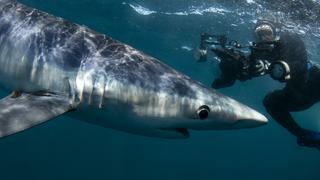 The sharks are in the area throughout the year but numbers peak between June and October. A visit to the Cocos Islands can be combined as part of a private cruise of luxury yacht charter in Costa Rica. 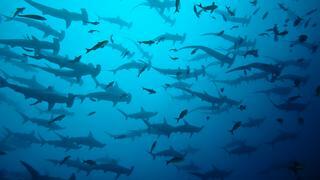 In the waters off the Cocos Islands, which are more than 300 miles from Costa Rica's coastline, you can see scalloped hammerhead sharks in vast numbers. This experience used to only be open to experienced divers but it is now possible to enjoy the spectacle inside a three man submersible. The sharks are in the area throughout the year but numbers peak between June and October. A visit to the Cocos Islands can be combined as part of a private cruise of luxury yacht charter in Costa Rica. Thresher sharks normally live in deep water and are nocturnal so can be a difficult spot for divers. Although they can be found elsewhere Monad Shoal is where they are most regularly sighted. Monad Shoal was recently made a marine park in order to try and protect them. The best time to catch a glimpse of these sharks is before sunrise so this experience will require your alarm clock to be set early.